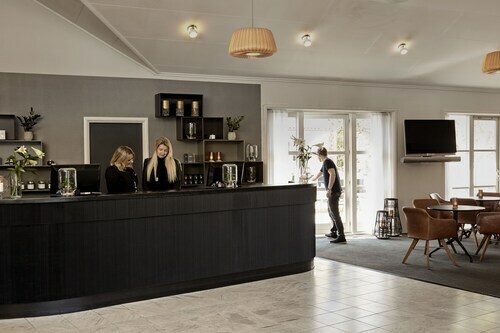 Situated in Kerteminde, this hotel is within a 10-minute walk of St Lawrence Church and Fjord & Baelt. Johannes Larsen Museum is 0.6 mi (0.9 km) away. Pet owners shouldn't miss Kerteminde, a city known for its aquarium, and sights like St Lawrence Church and Fjord & Baelt. Culture enthusiasts will want to visit Johannes Larsen Museum and Ladbyskibet. Other things to see include Hans Christian Andersen Museum, Hans Christian Andersen's Childhood Home, and Funen Art Museum. Need a pet store? Try Plantorama Odense, Tropica, or Funen Aquarium Center. For vet care, Østfyns Dyrehospital, Rynkeby Dyreklinik ApS, and Rynkeby Hesteklinik ApS are located in the area. Weather can make a huge difference, especially if you want to spend time outdoors. Here are the average daytime and nighttime temperatures to help plan your trip in Kerteminde. From January to March, average temperatures range from 45°F in the daytime to 31°F at night. Between April and June, the daytime average is 67°F and the nighttime average is 34°F. From July to September, average temperatures range from 69°F in the daytime to 46°F at night. Between October and December, the daytime average is 55°F and the nighttime average is 33°F. i m laike to do some business b that i come to see the pleas to make my mand for new business.